Firefox 9 For Android Released With New UI For Tablets And Faster Start-Up Times – Download Now! 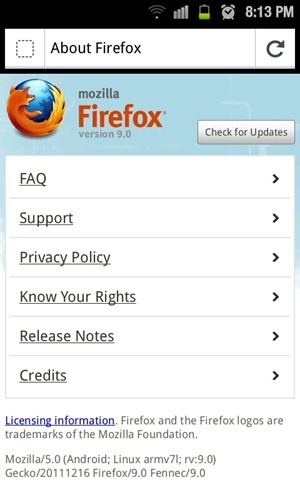 After releasing Firefox 9 on the desktop, Mozilla has updated Firefox for Android. It, too, is numbered version 9 and comes with a new UI as well as better performance. Details after the jump! News of the update comes straight from Mozilla’s official blog in the form of a post in which they discuss the state of Firefox for Android and the new features introduced in Firefox 9. The biggest new feature included in this update is an all new user-interface (UI) for tablets: tabs appear in the form of thumbnails on the left while you browse the internet on the right and you can swipe left to hide the column of tab thumbnails if you want the web page to cover the entire screen. This column goes away when you’re in portrait mode. Besides this, there is a new Action Bar menu to the right of the Awesome Bar from where you can access commonly used actions and other settings. Other than that, Mozilla claims that start-up time is now faster. Developers for mobile apps can now make use of Camera input support so they can get access to the device’s camera for use on web sites. We’ve tested the update on a Samsung Galaxy S II on Android 2.3.3 Gingerbread and can confirm that it works as claimed. It is certainly snappier since the last time we used it, but it just isn’t as smooth or quick to load webpages as the stock browser. You can actually see the sluggish performance about 0:23 into the video embedded at the end. However, features like Firefox Sync, the ability to install plugins and a user-friendly UI makes Firefox for Android a viable alternative browser, and you should definitely try it out. If you’re interested, Firefox 9 for Android can be downloaded for free from the link embedded below. Be sure to let us know what you think of it in the comments section over on our Facebook page.